Grab your peg leg and your parrot—and don’t forget the underpants! 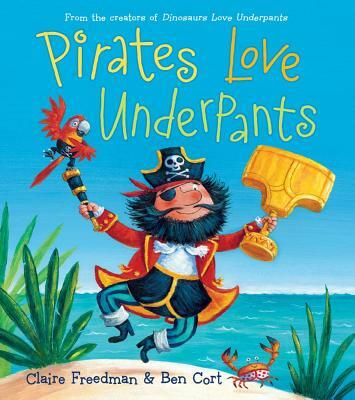 This wacky picture book pairs pirates and underwear in an uproarious adventure. For the Captain’s treasure chest. This laugh-out-loud Underpants adventure is full of pirates, sharks, and treasure. You’ll be yo-ho-ho-ing with hilarity until the pirates conclude their zany expedition! Ben Cort is the illustrator of several children’s books, including Aliens Love Underpants and Octopus’s Garden, which have been published in eighteen languages in twenty countries worldwide. Ben lives in Bedfordshire, England.